Samantha Hershey will become a third-generation Laurier graduate when she earns her Bachelor of Arts degree June 15. She joins her grandfather Sidney (BA ’91), grandmother Ruth Eleanor (BA ’75), father Brian (BA ’87), aunt Beverly (BA ’74) and uncle Stephen (BA ’71). With cousins and half-brothers who attended other universities, Samantha didn’t feel pressure to come to Laurier four years ago. Instead, it was a tour of Laurier’s Waterloo campus that touched her. Tradition is something that underpins Samantha’s entire university experience. While pursuing her undergraduate degree in philosophy, she says there were many moments where she felt the presence of her family. “I have definitely thought a lot about my family while walking through this campus,” says Samantha. Her grandfather spent over 30 years completing his degree at Laurier, which was then called Waterloo College. When Samantha took courses at the Waterloo Lutheran Seminary, she recalled that her grandfather also took classes there in the 1960s. 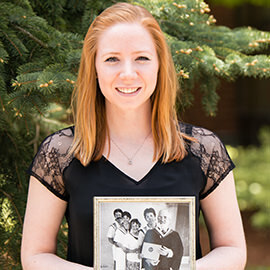 While volunteering with the Laurier Off-Campus University Students (LOCUS) program in MacDonald House, she thought about the significant amount of time her father spent in those hallways as a resident in the 1980s. But one particular connection held a special meaning for Samantha. Despite the family history behind Samantha’s degree, she made sure to carve out her own experience. She will be the first philosophy graduate in her family and has made lasting bonds through her work with LOCUS. Samantha will pursue a Master of Arts in Philosophy at the University of Waterloo in the fall. She hopes to complete a PhD and eventually become a bioethicist. Samantha will graduate on June 15 at 2 p.m. at the Athletic Complex on Laurier’s Waterloo campus – her family will be there to cheer her on. The Hershey family is one of many families who have attended Laurier throughout generations. Share your story with #LaurierLove.